Mix the pork meat with the chicken broth, salt, and bay leaf. Cook for 55 minutes or until meat is soft. Remove from broth and shred. Warm up the tortillas. Fill one tortilla with pork, cheese mix, as much salsa as you want, avocado, and chopped onion. To save time, cook the meat in a pressure cooker. If you wish, you can substitute salt with 1 1/2 tablespoon taco seasoning. These tacos are finger-licking good! Pork meat is very flavorful, so it doesn't take much to make it even more delicious. The four-cheese combination is where you can add your personal touch, whether you like it more American style: with cheddar, Monterey Jack, mozzarella, and pepper Jack cheeses; or more Mexican style: with queso enchilado, queso fresco, Oaxaca cheese, and Manchego cheese—to name just a few options. For these tacos, I use my own mix of Oaxaca cheese, queso fresco, queso enchilado, and Cotija cheese. I love the combination of melting cheeses and younger cheeses. 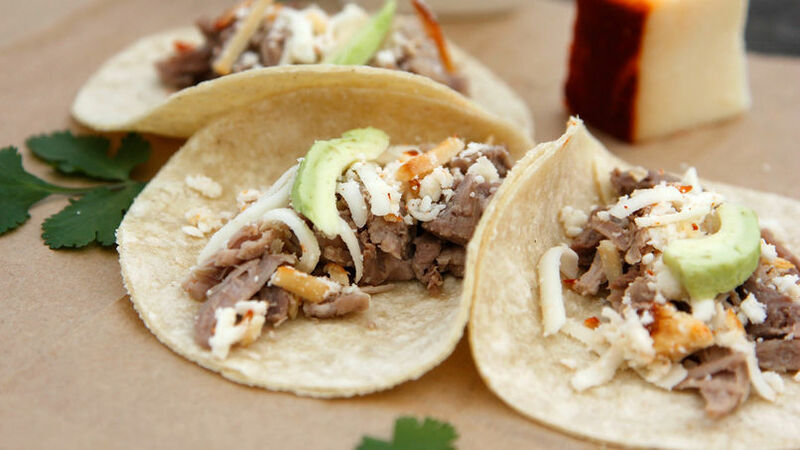 However you make them, these pork tacos will be a hit with the whole family.